Michael Collins produced a rollercoaster finish the lead the Irish hopefuls after the first round of the opening Europro Tour event of the season - the Motocaddy Masters at Wensum Valley. The Cork player was one-over par with seven holes to play but sandwiched bogyes at the 16th and 17th between four consecutive birdies from the 12th to the 16th and a closing birdie at the par-five 18th. It all added up to a two under par 70 for Collins, who is tied for sixth place, five shots adrift of leader Dale Marmion (65). Collins said: “I played very solid hitting 16 out of 18 greens, which was a must around here as it’s very difficult to get up and down”. Kildare man Paul O’Hanlon, who broke his professional duck on the Hi5 pro Tour in Spain a few weeks ago, is the next best of the Irish in a share of 10th place after a one under par 71. Limerick’s Tim Rice and Foreireland’s Mark Staunton had four birdies and four bogeys in level par 72s to share 22nd place. However, the rest of the Irish failed to break par with Portmarnock’s Noel Fox and Neil O Briain posting one over 73s. Derry’s Michael McGeady played his first 10 holes in three-over par but after getting back to level with an eagle two at the 316-yard 12th and a birdie at the par-five 14th, he bogeyed the 15th and 18th for a two-over 74 that left him tied for 53rd with his North West club mate Brian McElhinney. Barrie Trainor shot a three over par 75, Brendan McCarroll and Damian Mooney 76, and the Island’s David Rawluk a six over 78. Pacesetter Marmion had eight birdies an a bogey in a seven under par 65 to lead by two shots from fellow Englishman Rhys Black with James Hepworth alone in third after a 68. 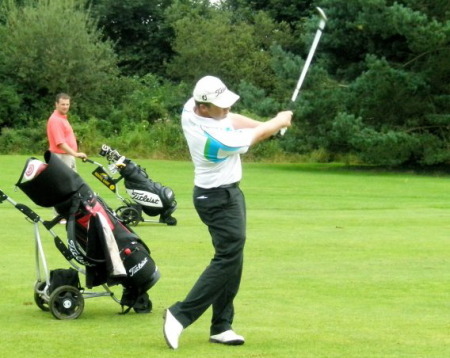 Paul O’Hanlon has an excellent chance of notching his second professional victory in the space of a month in the Europro Tour’s Motocaddy Masters at Wensum Valley. Paul O’Hanlon and Michael Collins made a strong start to the Europro Tour season when they shared fourth place behind Australian Daniel Gaunt in the Motocaddy Masters at Wensum Valley in Norfolk.